Many diets rely on the theory of fasting as the core of the process. This includes avoiding foods during certain times, skipping meals, restricting your diet to certain foods or consuming no solid foods. The concept behind intermittent fasting is nothing new, if you consider that our early ancestors had to “fast” while chasing down their next meal or finding edible foods. The general concern with fasting is the potential impact on the human body, such as stress on the gastrointestinal system and metabolism. Also, practiced as part of a diet, people who fast often regain any weight lost and sometimes more (Anson, 2003). These issues are not necessarily due to the intermittent fast, but rather with the way people diet by restricting foods for long periods of time and failing to stay appropriately hydrated. Understanding the difference between fasting and intermittent fasting can help explain why many diets fail: the practice of an all or nothing approach. Long-term fasting, in which a person fails to eat or restricts required nutrition for long periods of time, can be harmful to the body. Most experts agree that people should consult their medical providers before starting any fast because if done inappropriately, fasting can lead to damage of the gastrointestinal system or circadian rhythm (Mattson, 2014). As an alternative to a full fast, intermittent fasting involves limiting food intake for shorter and more specified periods of time. The practice is done in brief intervals, such as two days of fasting each week (known as the 5:2 diet), only eating once in a 24-hour period, or eating early in the day and fasting till an evening meal. Studies of fasting— from experiments on animals to longitudinal studies of people dieting—and its effects on the body have varied. In one particular fasting study with rats, researchers used extreme food restrictions, to the point of impacting organs. 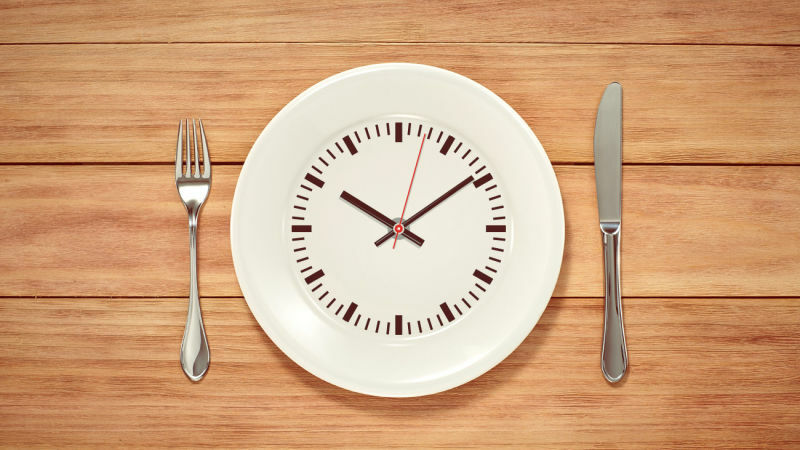 They concluded with a recommendation that humans avoid taking intermittent fasting to this level and instead work with their physicians to develop plans where food intake is reduced for only short periods of time (Anson, 2003). Additional animal studies have found that controlled fasting may improve the subject’s health indicators including blood pressure, insulin sensitivity and inflammation. Although results were reported in reference to animal subjects, researchers believe the improvements were due to the cells’ ability to handle stress better as a result of fasting (Mattson, 2014). The author also cited a few studies indicating that intermittent fasting may have a positive impact on helping to lower the risk of certain cancers as well as potentially protecting brain cells against diseases such as Alzheimer’s and Parkinson’s. Although studies in this area lack conclusive results that negate the cost benefit analysis of fasting on the human body, most studies agree that fasting is a natural experience that may help our bodies adapt. They caution that although weight loss may be achieved from intermittent fasting if done correctly, fasting should done for brief periods of time and only after consulting with a physician to ensure that this approach is medically appropriate. Anson, RM (2003). Intermittent fasting dissociates beneficial effects of dietary restriction on glucose metabolism and neuronal resistance to injury from caloric intake. Proceedings of the National Academy of Sciences, FASEBJournal. Mattson, MP (February 4, 2014). fasting: molecular mechanisms and clinical applications. Cell Metabolism, 19, 1932-7420: 181–92.